You are probably aware of the range of Zhu Zhu hamsters, cute little robotic hamster that make squeaky noises and move around with a touch of intelligence enabling them to navigate around your floor all day long. They are hugely popular toys and seem to attract children of all ages, we have a variety of hamsters, the boys have the battle arena and Chloe the grooming salon to entertain their furry friends, and they get played with a fair amount, the hamster more so than the play sets. 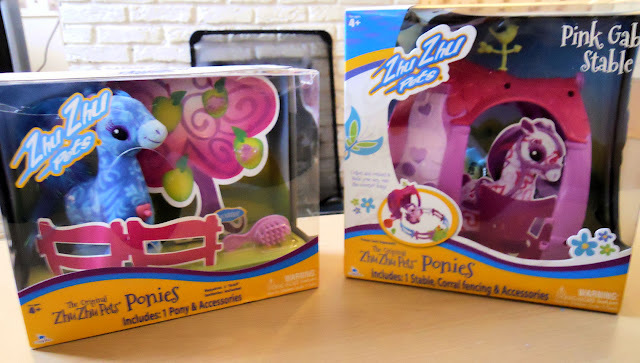 The range however has just expanded, now joining the Zhuniverse is a range of pretty little ponies. 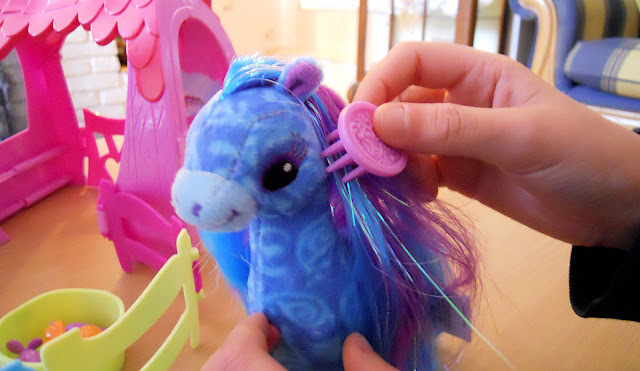 The Zhu Zhu ponies are the latest in the Zhu Zhu range, and really are rather lovely, with their long flowing mane which can be brushed and styled, and their rather sweet noises and movement these are abit like furry moving my little ponies. And as ponies are a huge hit for lots of girls these make a lovely gift. 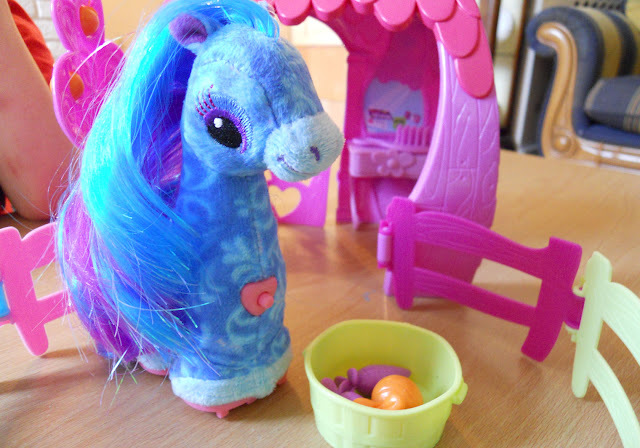 The ponys are sold separately, and there are 6 to collect priced around £14.99 and to add to the collection is a set of pony stables which interconnect to make your own Zhu Zhu pony world. Each individual pony comes with a brush and a couple of little accessories the pony we received came with two little clips for her hair. The gable stable we received came with lots of accessories, 7 sections of fence, a bucket and several food items, there is also a little section of grass which the food can slot into and a drawer to store your accessories.